My name is Silvia Rodriguez, and I’m a Venezuelan globetrotter. I arrived in Evanston around four years ago with my family, and since then have expanded with the birth of our second son, a true Evanstonian. We too have become Evanstonians by adoption, as this town has welcomed us with open arms. We love our community, which I think can always become stronger with contributions from all of us. I feel connected by being involved in volunteerism for causes I feel strongly about (race inequality, social justice). As a former book editor, I am glad we have such an amazing local library. I have always used library services extensively everywhere I have lived, but EPL has by far been my favorite. We are loyal, die-hard users! This book is a great reminder that so much about what happens throughout history is deeply influenced by chance, by luck, by circumstance. Silberman’s meticulous research shows how a series of events led to one line of research prevailing over another resulting in the concept and imagery of autism we sadly share nowadays: that in which autistics are portrayed as less able, less valuable humans to society, as expendables. I am hopeful that with the work of disability self-advocates (Silberman does right in mentioning some in his book) and revisionist titles such as this, society will shift toward a more just and ethical idea of autism and the many contributions autistic citizens can bring to us all. My name is Janine Macris, and I have lived in Evanston for a very long time. I appreciate its love of trees and the arts and its community, and I have spent many hours at the Evanston Public Library, even before I could read. I teach children, including my own, through my love of the power of words, and my husband builds me furniture and I love it. We read every night and it’s a great gift. It took me years to finally make it beyond a few chapters in this book. I had never been able to get past my college life’s raw imagining of the Running of the Bulls, but once my professor helped frame this feminist reflection of a woman traveling along and craving companionship with a friend filled with the same strain, I re-sought existentialism as a crisis amid hope. It was through this read that I saw Hemingway’s infamous short-and-sweet style being as transient as his characters’ lives. I finally understood his talent for code-switching symbolic gestures in a rebellion to be free. From there Hemingway’s door opened for me, and I felt accomplished and proud to get to the root of time’s angular woven ways. My name is Hilde Kaiser. I live in northwest Evanston where I am a Jill-of-all-trades: writer, lead parent, certified Nia instructor, student of earth medicine, knitter, film buff, and home baker, with a bundle of volunteer work thrown in (all in the domain of parenting, education, and personal development). My idea of heaven is reading a book at the Evanston lakefront with a little something to eat from Hewn bakery. As an avid reader (75 books so far this year) I am grateful for our area libraries and their superb programming (hey, how about Our Mutual Friend for Mission: Impossible?). My secret confession is that my favorite thing to read is “The Traffic Guy” column in The Round Table. I’m not above choosing a book by its cover, and the lush, evocative, and eccentric portrait of its subject, Margaret Cavendish, convinced me to pick this novella up, knowing nothing about it. It’s so pretty. It’s one of my favorite books of the year because I’m still thinking about this poetic, experimental, slightly odd gem of a historical novel that deserves lots of readers. “Mad Madge” was a 17th-century proto-feminist who was one of the first women to publish under her own name and to earn a living by writing. She also dressed herself on her own terms – crowds assembled to see what she was wearing when she went out for walk. There’s a fab article in the New Yorker on the book as an example of “archival historical fiction” (as opposed to “realistic historical fiction”). Which is another way of warning you this book is anything but straightforward, but it is one-of-a-kind, like its subject. And the language is oh-so-pretty, like the cover. 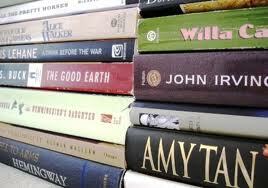 Reading Literary Fiction Will Boost Your Empathy I.Q. Want to increase your emotional intelligence? You might want to put down that Danielle Steel book and start reading Chekhov. Researchers from New York’s New School for Social Research recently published a study in the journal Science which found that “people performed better on tests measuring empathy, social perception, and emotional intelligence after reading literary fiction, as opposed to popular fiction or serious nonfiction.” The reason according to the researchers is that “literary fiction often leaves more to the imagination, encouraging readers to be sensitive to emotional nuance and complexity.” Louise Erdrich’s novel The Round House which was used in the experiment, commented: “the researchers found a way to prove true the intangible benefits of literary fiction”, adding: “Thank God, the research didn’t find that novels increased tooth decay or blocked up your arteries.” Read more on this fascinating study in this NYT article.